So sweet all bundled up and ready to share a cup of tea with a friend! Base: Brown cardstock 41/4" by 51/2"
First Layer: Light blue solid from 6x6 pad 4"x 5 1/4"
adhered to the center of the card. Cut a 1/4"x 1 3/4" piece of the light blue cardstock (from the background) and create a "V" to form a banner shape. Stamped with two spoons in Rich Cocoa Memento Ink, and adhere it onto a 1"x 1 1/8" piece of blue dot cardstock and adhered to the upper right corner. Bling was added along the top edge of the banner. The girl image was stamped on white cardstock in Rich Cocoa Memento ink, and colored in using Copic Markers. Then I inked around her with a mix of Vintage Photo and Walnut Stain Distress Ink. It was layered onto a brown cardstock scalloped circle frame then adhered slightly off to the left of the center rectangle on the card. The teacup is stamped on white cardstock with Weathered Wood Distress Ink, with the "Tea for Two" sentiment stamped directly on top using the Memento Rich Cocoa ink. The image was punched out using a 1 1/4" circle punch, and the edges inked, and adhered to a 1 1/2" circle of brown cardstock. Finally this piece is popped up with dimensional adhesive to the chipboard teapot. The teapot was stamped on a darker blue paper in the 6x6 pad, fussy cut out, and adhered using Scrap Happy Glue. A few bling were added to finish it. This makes it easier to add seam binding, and avoids the bulk of lace being tucked behind your card. This means I can slide the bow I tie using this piece from side to side on the base ribbon until I get the position I want....I started doing this after I was tired of re-tying bows over and over (a perfectionist at heart....lol). This ribbon strip was glued about 1/2" from the bottom of the pattered paper, and then I glued the teapot on the right side directly onto the ribbon. Thanks for stoppin' by the cafe' today! Hope you're inspired to start your own "comfort crafting"! Hi There! 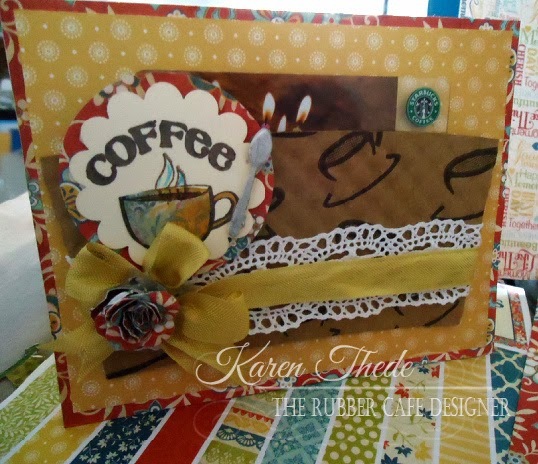 Kendra here today with a fun card using the February's Creative Cafe Kit. 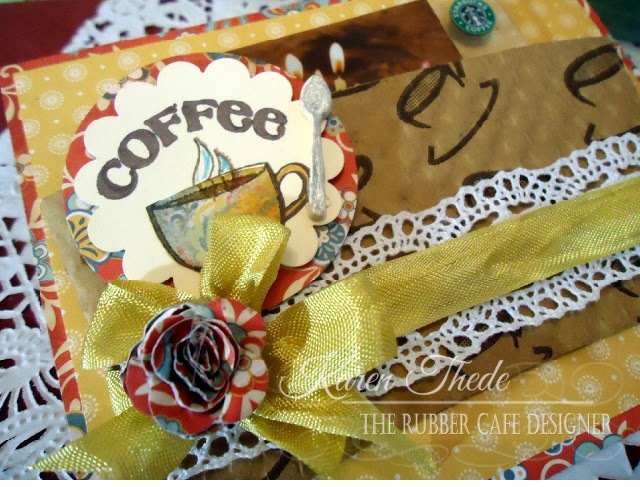 Each month the Creative Cafe Kits come with fabulously fun embellishments. This month there were some wooden tags, coffee scented embossing powder and gorgeous white lace, among many other wonderful things. 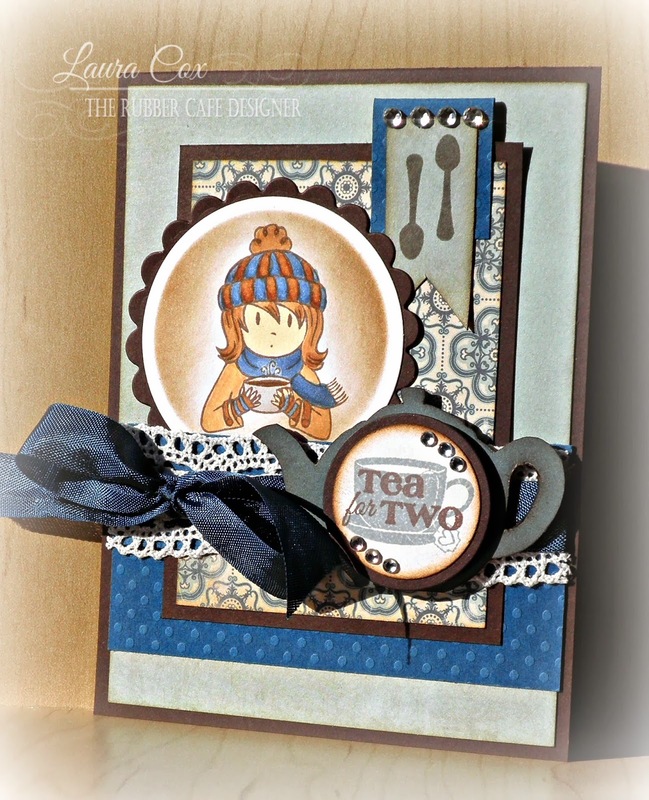 Step #1: I decided to use the stack of tea cups for my focal point on this card from the Tea for Two set that comes with the February kit. I inked it up with Rich Cocoa Memento Luxe ink and then stamped it on the wooden tag. 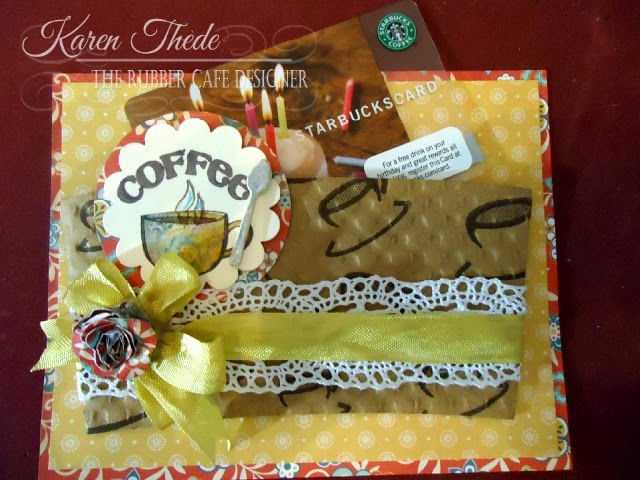 Step #2: I heat embossed the image with the Coffee Scented embossing powder that came with the kit. Then I colored my image with alcohol ink markers. ** Tip: Use a light touch, the ink will bleed on the wood embellishment. Step #3: The kit came with this gorgeous lace trim, but white didn't really match the colors of my card, so I colored it with my alcohol ink marker to match. Step #4: I trimmed a few pieces of pattern paper for my card and roughed up the edges with the blade of some old scissors for a shabby look. Step #5: The Creative Cafe Kit also comes with some beautiful Bazzill Swiss Dotted cardstock. To go along with the shabby look, I used some Walnut Stain Distress Ink and sponged is across the top of the raised dots. Then I used the Antique Linen ink on the edges of the card. Step #6: Now it's time to assemble the prepared elements from Steps 1-5. 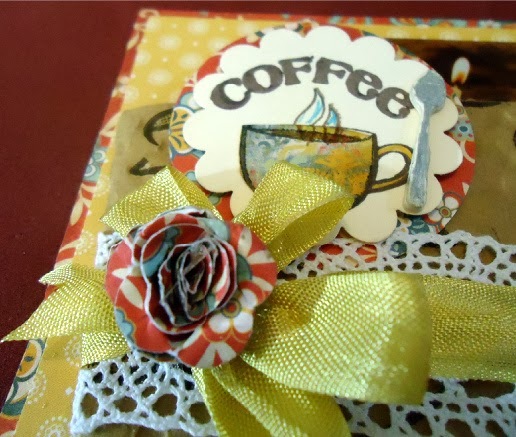 Step #7: I added a pretty bow using the dark red seam binding from the kit and then attached the tag to the card. I also stamped the sentiment from the Coffee Break Add-On stamp set to the bottom of the card. I inked it with Memento Luxe Ink (Rich Cocoa) and heat embossed it with the Coffee Scented Embossing Powder. Step #8: As a final touch, I added some scraps of pattern paper and more embossed sentiments and images to the inside of the card as a fun little surprise. 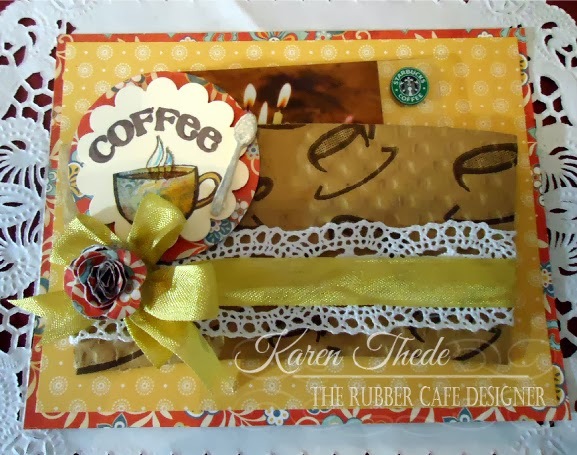 Enjoy your Creative Cafe Kit this month! Hello! Dawn Rene here to share a mini canvas I made using The Rubber Cafe's Framed Heart stamp. This stamp has an Zentangle feel to it. I love it! Here is a tutorial on how I put together my mini canvas! 1. My initial thought was to color in the Framed Heart stamp with Copic markers. But I really wanted to try something different - so I decided to go with watercolor pencils! 2. I stamped the Framed Heart stamp on water color paper with brown archival ink. 3. I colored in the Framed Heart stamp with water color pencils from Close to My Heart in earthy tones - Olive, Autumn Terracotta, and Desert Sand. 4. I used a small paint brush to wet the paper and blend the colors. 5. I added some texture by heat embossing Shabby White Embossing Enamel on the heart. 6. Next I created a frame from grunge board which I colored with various Tattered Angels inks. 7. I covered the canvas with Faber-Castell Gelatos. 8. Once your canvas is dry, spray more Tattered Angels ink on the canvas. Here is a close up of the finished canvas! Hello Rubber Cafe' Fans! Hope you are having a great week so far. 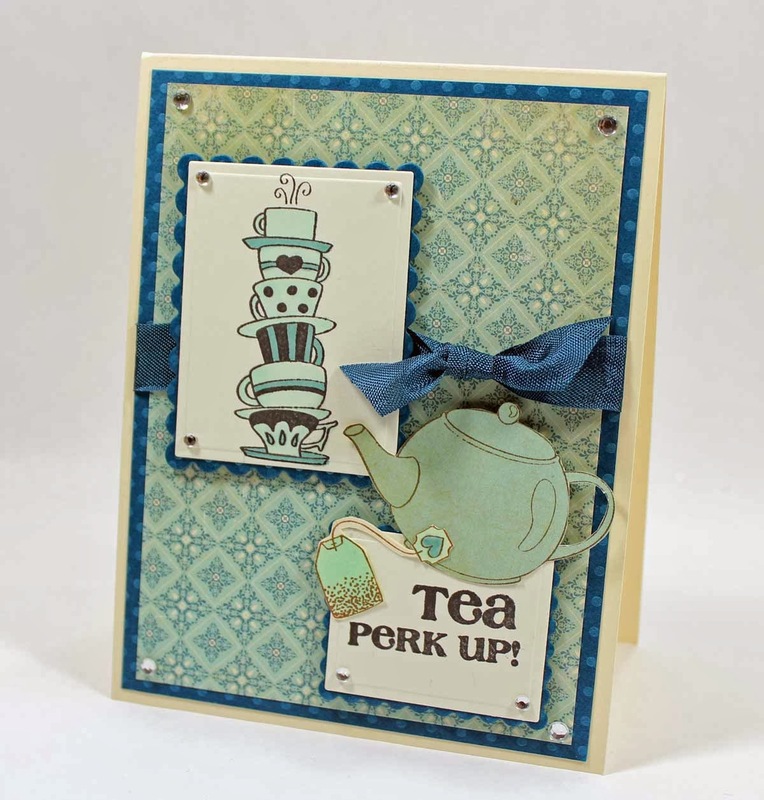 Today I want to share with you a cute card I made using the February Creative Cafe' Kit - Tea for Two. All supplies I used are from the February kit. This card is pretty easy....the only thing that takes any amount of time is the fussy cutting. Here is my card! There is nothing hard about this card. I did use a couple of my sets of dies from Spellbinders but I always try to use sets I think most crafters have. This time I used the Scalloped and Classic Rectangles. I used the Ivory cardstock for the base of the card and it measures 4 1/4 x 11" and is folded at 5 1/2". The dotted swiss blue is cut to 4 x 5 1/4" and the patterned paper is cut to 3 3/4 x 5". 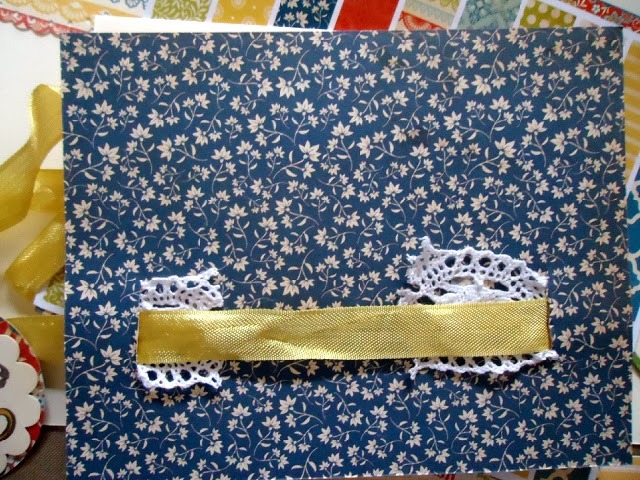 I always put my layers together and tie the ribbon into place before placing everything onto the base of the card. That way the ribbon is not showing inside the card. Here is a quick video showing how I put everything together! Happy Monday Everyone! Today - I'm sharing my Coffee sleeve gift card with you, featuring the Creative Cafe' kit for February Tea for Two, and our add-on stampset Coffee Break! I started out with the coffee sleeve, I have to say I've been collecting a bunch of these and just waiting for the right project to use for these! Folded flat my coffee sleeve make the perfect pocket for my Starbucks Coffee Gift card. 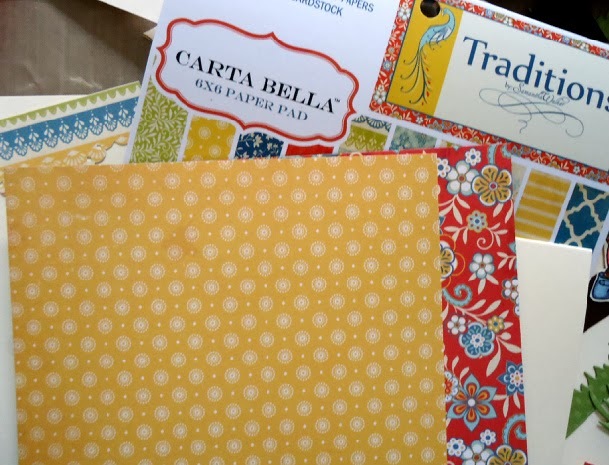 I've layered my card - which is a standard A2 card 4 1/4 x 5 1/2" with different pattern papers from the paper pad in the kit, Carte Bella's Traditions. I love the colors in this pad, so it was really hard trying to decide which ones to use. I've also punched a 2" scallop circle from the Red print, and out of Ivory 1 7/8" circle. You may also have noticed, I stamped my coffee phrase on the curve- the stamp is straight here's a quick tutorial on how I stamped and curved it so it could be easily stamped to my already punched circle. Taking advantage of the clear polymer stamps - I used my Fiskar stamp press with a grid to lay my phrase and place it 'on a curve' I snipped parts of the stamp at the top with my scissors to help ease it at the curves. Than I placed the coffee cup directly below- allowing me to stamp both in my scallop circle all at once. See the first and second images below. 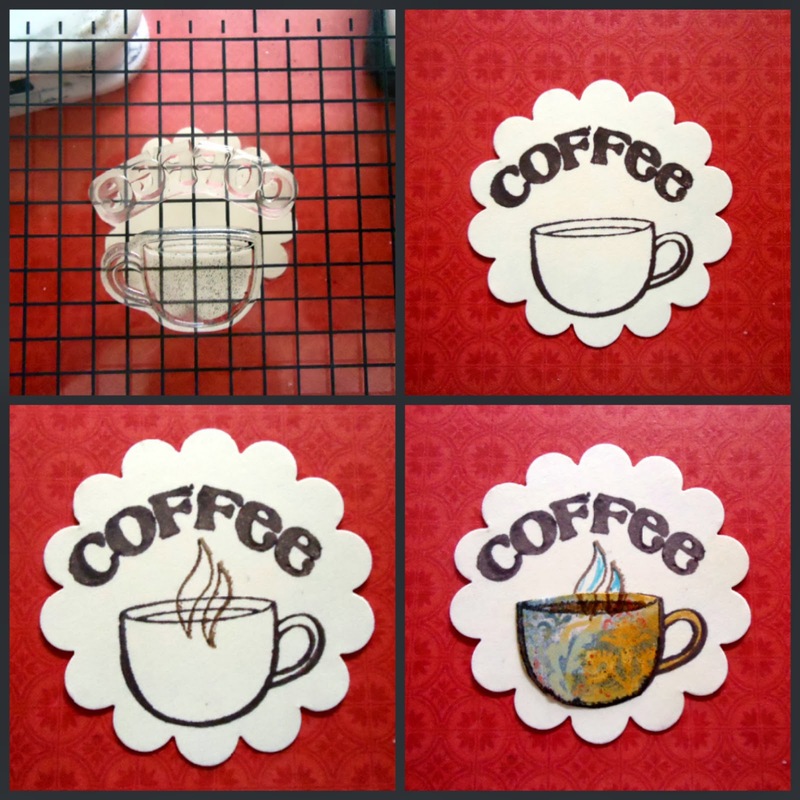 Now I'm ready to add in the steam for my coffee - since I'm paper piecing I was able to stamp it close into the inside rim of my cup like the third image above. To finish it - I stamped my coffee cup again this time patterned paper. I fussy cut it out, leaving the handle behind. 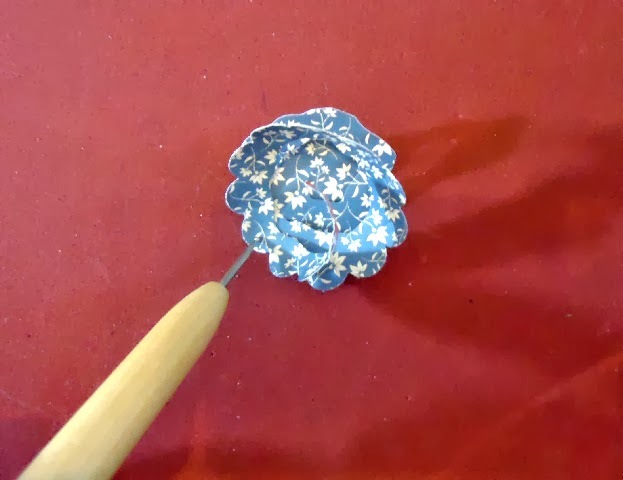 It was too difficult to cut so I just colored in the handle and paper pieced just the bowl of the cup. I also took my Vintage photo distress marker, and extended my steam lines into the inside of the cup and colored in the coffee. I used the Scattered Straw distress marker and highlighted the right side of the cup while coloring in the coffee cup handle. This piece was than layered with the other punched scallop of print paper. To finish it up I popped it with dimensional adhesive and attached to the front of the coffee sleeve. 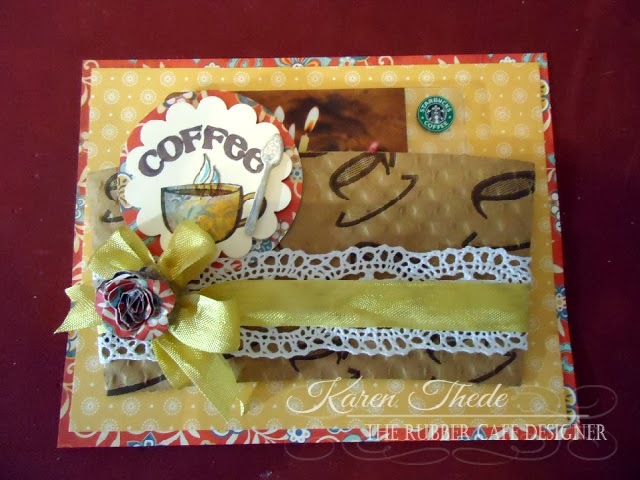 To add the lace trim and ribbon, I layered both around the bottom half of the coffee sleeve - this helped to keep it together and attached to the card front. Before ahereing my layers onto the card front, I used my zacto blade and cut a 1" slit on each side so I could push both the lace and the ribbon through and around to the back, all snug and cleanly tucked away. Here's a view of the back side - I saved on lace by cutting at each side. While the ribbon I trailed all the way behind and back to the front to tie in a double bow. Wanting to add more color I had an extra scallop circle punched in the red print, so I free-hand cut in a spiral working my from the outer edge into the center leaving a small circle about 3/8" around- rolling it quilling style I created a small paper rose, which I added to the center of my bow. *TIP: To make it easier to roll this paper - I took my stylist and worked the fibers down a bit on my stamp foam pad - also when you have two sided paper - the side that you want to show is the side you keep to the inside. In my picture below, if I keep rolling with the blue to the inside - I will end up with a blue rose, I changed my mind and flipped it over to the red side - ran my stylist around it again in circular motion and than started rolling from the outside in. Hot Glue gun the rolled portion to the small area in the center to hold it firmly coiled in place. Here's another closer look at my finished flower. I added a diecut spoon, that I colored with my Silver Pitt pen from Faber-Castell and last but not list tucked in my Starubucks Coffee Gift card! Hope you've been enjoying this month's kit, and that we've inspired you to get creating! Keep checking back we have something new everyday!